Hikers, bikers and trail users may stumble on something unusual this summer—a small box roughly the size and shape of a cigarette pack on local trails, quietly counting the users passing by. Sustain Blaine economic development group and the Blaine County Recreation District are teaming up this summer to collect data on how many and what type of users visit trails throughout the Wood River Valley. Sustain Blaine Executive Director Harry Griffith said that 15 of the infrared counters have been placed on trails so far. They work by sending an infrared beam across the trail. When the beam is interrupted, ideally by someone crossing its path on the trail, the counter takes a note. 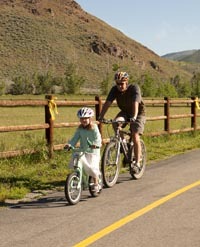 Recreation District Executive Director Jim Keating said the counters are currently ticking off users—including bikers, hikers, skate skiers and trail runners—throughout the Wood River Trail System from Ketchum to Bellevue, in Adams Gulch and at trailheads in the Croy Canyon and Greenhorn Gulch systems. Keating said he hopes to have data released throughout the summer, but that sometimes glitches can occur. Placing the counters is not as easy as it looks, he said. "They have to be placed a little off the trail, but not in a place where wildlife can take a munch on them," he said. "Sometimes, oh, one of the counters is not working, or a kid bumps into it, or the counter is next to a bush, and the bush sways in the breeze, and the counter picks up 10,000 hits." Keating said the study is further complicated with the vast, interconnected nature of the trails in the valley. "The amazing thing about this project is that it starts off pretty simple, and then you start to think about the complexity of our trail system, and it becomes exponentially more difficult," he said. Griffith said the district and Sustain Blaine have gathered 15 counters and hope to survey 20 locations between now and the end of September. To accomplish that, some of the counters will be moved around. The counters will be supplemented by observers, Griffith said, who will take down age, gender and other information in person. The study will also determine the percentage of visitors that use the local trails. Griffith said there is a nearly "infinite" number of ways the collected data could be used. The data will be shared with the Sun Valley Marketing Alliance for use in its upcoming marketing campaigns, in addition to being available to retailers, event planners and other interested parties. "Let's say I am a retail shop," Griffith said. "If I suddenly saw that there are a lot of trail runners using a certain set of trails, [I] might want to stock up running gear—or stock up in the southern store, which is closer to the trails being used." He said the data will also help form a baseline, so marketers can tell whether certain events or improvements help boost the number of visitors or certain types of users on the trails. Keating said the Recreation District would use the data for trail maintenance and improvement. "It has a lot of uses," he said. "We're still working at the moment to make sure we set it up in the right way. It's all about getting good data."